4. Dust and grime aren't that big of a deal. "Dust appears on the shelf, but I just wipe it off once a month or so while the dishes are being cleaned. Really, no dish sits there long enough to accumulate dust." 5. Shelves are actually easy to organize. Truth time: New cabinets aren't cheap. 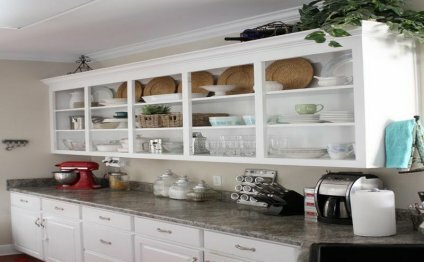 So if you're craving a new look for your dated kitchen, shelves can be the perfect, economical solution. Tight budget in mind, this clever blogger completely transformed her dark, dank kitchen into a bright an airy one. "Open shelving is a very budget-friendly option! It's a project that can be done in a day, yet it makes a huge statement when done well." 7. You can show off your pretty dishware all the time. "My dishes are by Emma Bridgewater, and in my opinion, they are too pretty to shut behind doors!" Considering open shelves but afraid to take the leap? TELL US: Would you try open shelving?